Monday is back again and that means it is time to share with you all what we will be eating this week. 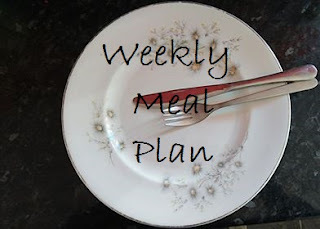 I managing to get our main meal shopping to under £30 a week which is great as we are eating healthier and spending less. I have joined slimming world (you can read about it on Wednesday) so all a part from the pizza are recipes available via their website. The pizza will be home made, dough included so I'm hoping that it won't cost me too many syn's but we will see.